Click here to claim your 20% off limited offer on gutter clearing. These are indication costs for gutter clearing on the average property, invoices are calculated on exact measurements shown below for our fixed price service. 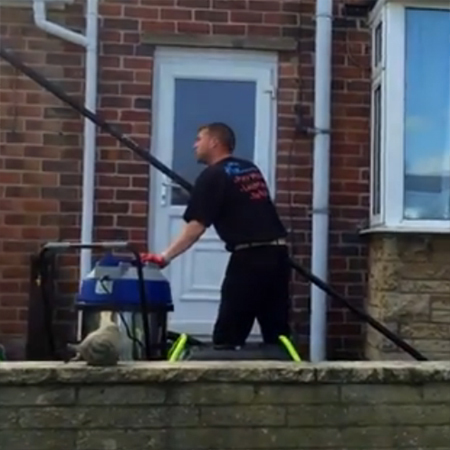 Start the video to view our gutter clearing in action! Using an industrial specialised vacuum system we are able to reach 40 feet or more in the air whilst our operators work safely from ground level. We use no ladders wherever possible when cleaning gutters, our ground based equipment means this is not normally necessary. Where required we have a high-tech cctv cameras mounted at the top of our vacuum system or on inspection poles giving the perfect viewing angle for our operators to get to even the most difficult angles. This can also be used to record footage, for instance for claims against third parties (this is an extra chargeable service). A blocked gutter can cause water to build up and enter the property if left unrepaired, resulting in tens of thousands of pounds worth of repairs. Blockages will always occur in the most difficult to reach areas (such as above conservatories etc) but this is no problem for our high power vacuum system. We pride ourselves on offering the most comprehensive and professional service available, Please browse the other services we offer and use the form below to book with our special offer. Never been so pleased to have a salesman knock on my door. Whata good job. I am OCD and my windows are faultless. We have used these cleaners for a while. Thought i should say thanks for the clean gutters. Very satisfied. 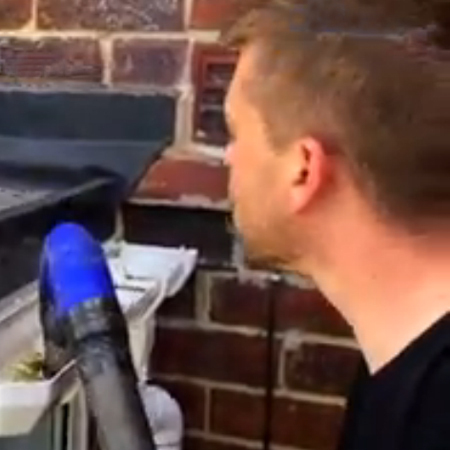 Uk window clean are by far the best gutter cleaners ive ever used. Will use again. Thanks for your consistently good work.Our gutters have never looked so good until you came to clean. Our standard rate for gutter clearing is shown above per metre. Heavily blocked areas will be at a higher rate again shown above (this is because of the extra time that we would need to spend to clear them). However these are very unusual, properties that have been left in disrepair for quite some time for instance. We do not price per job or give estimates, the aforementioned costs are fixed per metre. You may estimate from taking your own measurements if you like but our operator will charge based upon the exact measurements of whatever he has cleared after completion of the work. Although we do not have a call out fee, we do have a minimum charge (again mentioned above) because otherwise we may be requested to clear very minimal sections and this is not commercially viable. Any special offers are only for a limited period and will be confirmed when booking. Our system is an industrial high powered vacuum which works through long reach poles. We are able to reach heights of 40ft as standard and in some cases 60ft (only where loading limitations can be met). Where required, we use cctv for initial inspection or during works and can provide drones in some instances (some situations where this may be required would be whilst working on buildings where access is extremely limited and viewing remotely is essential to ensure cleared). We do not maintain recordings long term to comply with privacy and data protection regulations but again where specified, footage can be provided (claims evidence for example). These services are not standard and where specified there will be additional charges which will be fixed and agreed in advance. 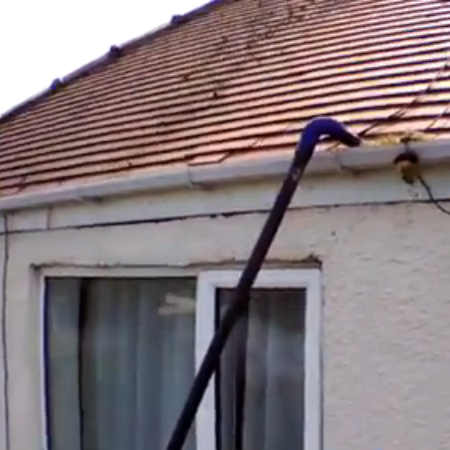 This service is to clear the inside of gutters. 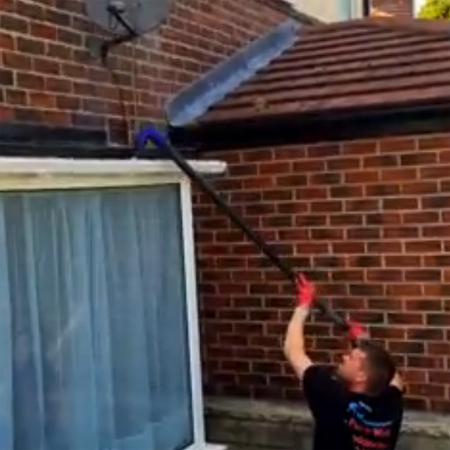 We provide cleaning services for the outside of gutters and other rainwear/facias etc. but these are not priced in accordance with the prices on this page. Please contact us for further details if you require pricing for any other service. We provide gutter clearance as a maintenance service to remove debris from your guttering. In the main this removes leaves and plant debris along with other organic matter. Provided gutters are regularly cleared this matter does not become compacted and is easily removed with our vacuum system. You will note from our video in particular (shown on this page) that it is possible to remove severely compacted matter and even plant growth, however this is of course dependent on the extent of the problem. We will always use our best endeavours to clear all gutters and will only charge based upon what has been cleared. We do not clear drains or downpipes, this is a job for drain specialists. In many cases the downpipes are indeed not running freely because the gutter above is blocked and in these cases of course the problem is solved once the gutter is cleared (because the top of the downpipe then becomes free), however we cannot guarantee the free flow of the downpipes and drains, there may be further blockages which are not in the gutters. We provide two prices per metre to cover most issues. Our standard per metre price is to cover normal conditions and in general where gutters are well maintained (normally on an annual basis), this will easily cover clearing. For other heavily compacted and soiled areas we reserve the right to charge the higher rate as specified. We cannot guarantee to clear everything. In the vast majority of cases we can access all areas and the clearing is fairly standard (even for heavily soiled areas). We take pride in clearing whatever is possible to be cleared but bad design or maintenance may make it impossible for us to complete certain areas. We will not charge for parts not cleared. In general the more often gutters are maintained, the better. There has to be a common sense policy applied to balance with cost. In the main, most houses will be well covered with an annual visit. However, some properties are situated in areas free of trees and other common gutter clogging situations and may require less. On the other hand some properties may be situated directly below trees or other prominent gutter risk implications and would need more regular clearing (possibly twice a year or more). We cannot give a specific recommendation schedule but will be pleased to offer best advice whilst clearing. Payment is due upon completion unless account facilities have been pre arranged.